Paris 27th October 2017. A number of promotional and cultural events organized in various cities of France under the Embassy’s Public Diplomacy initiative “Celebrating Pakistan” launched last year has greatly helped to further improve the soft image of Pakistan in France. This was stated by the Ambassador of Pakistan to France Moin ul Haque at a special ceremony held yesterday in the Embassy of Pakistan to acknowledge and appreciate the efforts and contributions of the members of Pakistani community to make the first ever grand Pakistan Festival held near Paris last month a resounding success. The Ambassador praised and thanked all the organizers, volunteers and sponsors for their hard work and support. He noted that this exemplary unity and solidarity demonstrated by the members of the community for a common cause has strengthened the image of the community in France. In his remarks, the Ambassador said that under the Embassy’s Public Diplomacy initiative titled ‘Celebrating Pakistan’ a number of events were held in various cities of France which included Qawali concerts, mango festival and a fashion show in Paris, setting up of cultural pavilion in the French city of Lyon, Pakistan Festival held in the French city of Avon, and Pakistani pavilion at the International Gastronomy Festival in Paris. 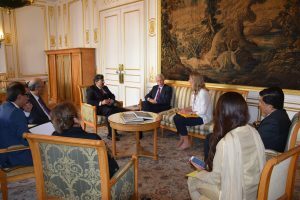 He said that Pakistan’s rich history and cultural heritage, arts & crafts, cuisine and music showcased during the Pakistan Festival and other events created a positive impact about Pakistan and its people in France. Ambassador hoped that the Pakistani community will continue to join the Embassy in its efforts to promote Pakistan with same spirit and zeal in future as well. Later, the Ambassador distributed certificates of merit to the organizers, sponsors, volunteers and media persons. Paris, le 24 octobre, 2017. Une exposition par un duo d’artistes, le peintre célèbre pakistanais M. Akram Dost, , a eu lieu à Paris du 19 au 24 octobre. 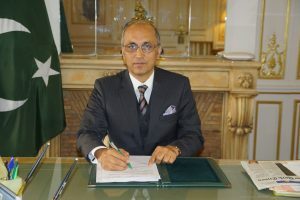 L’Ambassadeur du Pakistan en France, S.E. M. Moin ul Haque, s’est rendu à l’exposition. 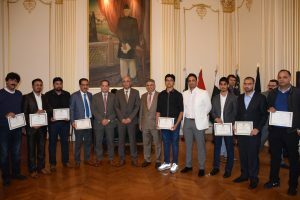 Tout en félicitant les deux artistes pour l’originalité de leur travail il a loué leur initiative d’explorer des points communs des valeurs culturelles et artistiques du Pakistan et de la France. En parlant aux deux artistes, l’Ambassadeur a dit qu’en exposant leurs œuvres ensemble les artistes du Pakistan et de la France contribueraient à forger des liens d’amitié et de respect entre les peuples pakistanais et français, et à créer une plus grande coopération et une meilleure compréhension entre les communautés artistiques des deux pays. Le célèbre peintre pakistanais M. Akram Dost, originaire du Baloutchistan, a dans le passé exposé avec succès ses œuvres à Paris aux côtés de l’artiste peintre français M. Bertrand Bellon. Paris 25th October 2017. A joint painting exhibition by Mr. Akram Dost a renowned painter and artist of Pakistan and Mr. Bertrand Bellon of France was held in Paris from 19-24 of this month. 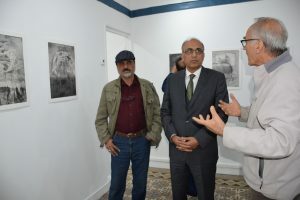 The Ambassador of Pakistan to France Moin ul Haque visited the joint exhibition and praised the two artists for their original work. He appreciated them for jointly exploring the commonalities of cultural and artistic values of Pakistan and France. While taking to the artists, the Ambassador said that the joint exhibition of artists of Pakistan and France would contribute to the friendship and respect between the people of Pakistan and France and would foster more cooperation and better understanding amongst artists fraternity of the two countries. Mr. Akram Dost who is a renowned painter of Pakistan hailing from Balochistan has successfully been exhibiting his art work in Paris along with Mr. Bertrand Bellon of France in the past as well. Paris 16th October 2017. Mohammad Pervaiz Malik Minister of Commerce and Textile has invited French entrepreneurs, and investors to benefit from Pakistan’s business friendly policies and invest in Pakistan in the fields of energy, infrastructure development, food processing, automobiles, tourism and information technology. The Federal Minister is visiting Paris as part of his European tour to discuss bilateral economic & commercial relations and as well as seek support for GSP Plus Review. During his stay in Paris, he held separate meetings with Mr. Jean Baptiste Lemoyne Secretary of State, Ministry for Europe and Foreign Affairs of France, Mr. Phillipe Gautier, President MEDEF International, Mr. Thiery Pflmlin President Pakistan France-Business Council and Mr. Didier Kling, President Paris Chamber of Commerce. He also visited French National Assembly and met with members of Pakistan-French Friendship group. The Minister noted that the existing volume of bilateral trade of US$1.4 billion was not commensurate with the true potential of the two economies and called for more exchanges and business linkages to increase the trade volume. During the meetings, upgradation of the Administrative, Economic and Trade Committee from Secretary to Ministerial level was also discussed to make it an effective and productive forum. The Minister also proposed revival of Air France flights to Pakistan to enhance connectivity and facilitate business travel. The Minister also appreciated the French support in the EU for trade related concessions, especially for GSP Plus and hoped that France would continue to support Pakistan during the GSP Plus review process. Paris October 4, 2017. A special fashion show by the world renowned Pakistani fashion designer Ms. Nilofer Shahid was organized by the Embassy of Pakistan to France in Paris to showcase seven decades of Pakistan’s fashion. The event was a part of 70 years of Pakistan’s Independence celebrations. 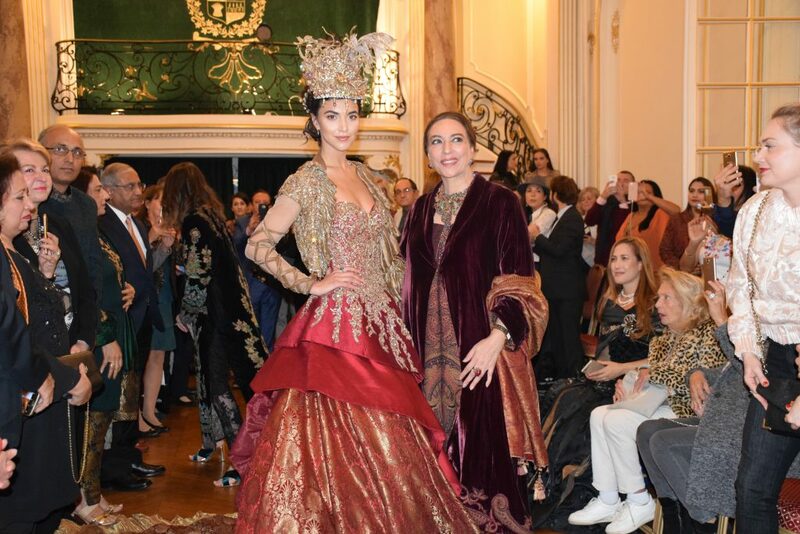 The Fashion show held in the Embassy of Pakistan was attended by senior representatives of French fashion industry, high end department stores, fashion schools and institutes, local actors and celebrities from the TV and film industry and the French and Pakistani Media in large number. The Ambassador of Pakistan to France Moin ul Haque in his welcoming remarks said that Pakistan is a progressive, fast developing and a forward looking country. He said that Pakistan’s fashion designers have received international acclaim and recognition for their talent and creative work. 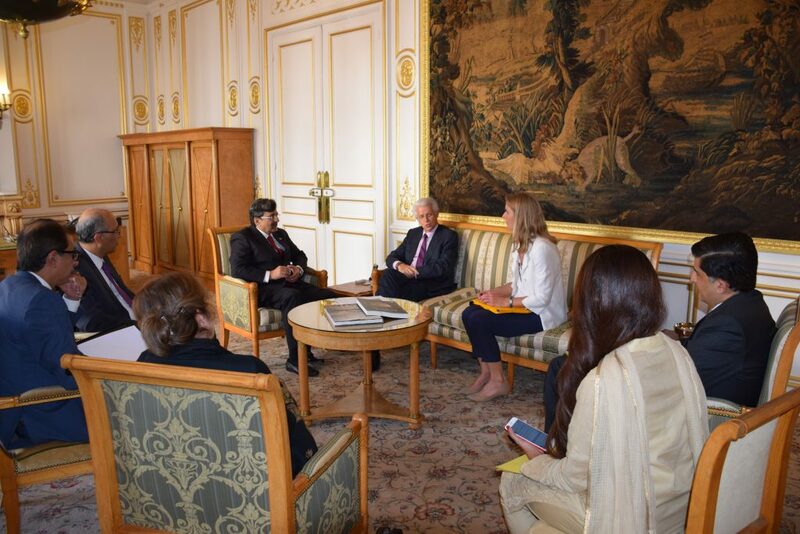 The Ambassador expressed the hope that the event would help in introducing Pakistani fashion designers and their work to the French fashion industry and creating useful linkages for further cooperation in this field. The first segment of the show was specifically focused on seven decades of fashion trends in Pakistan through a beautiful display of past and contemporary styles. The second segment of the show was Nilofer Shahid’s tribute to world’s famous Dutch painter Rembrandt. Her creative dresses depicting Rembrandts life and artistic career was highly praised by all guests. The Fashion show was also a part of the public diplomacy initiative launched by the Embassy for promotion of soft image of Pakistan. Ms. Nilofer Shahid called “the runway Empress of Pakistan: is one of the greatest fashion designer of Pakistan. She is a recipient of many international awards including “Grade de Chevalier” bestowed on her by the Government of France in recognition of her contributions towards arts and culture. L’UNESCO a franchi de nombreuses étapes importantes dans les domaines de l’éducation, de la culture, de la science et de la communication, malgré de nombreux défis. 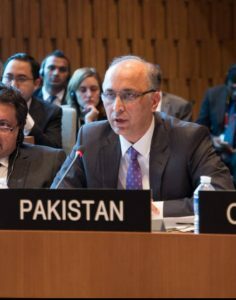 L’Ambassadeur du Pakistan en France et le Délégué permanent du Pakistan auprès de l’UNESCO, S.E.M. Moin ul Haque a prononcé ces mots lors de sa déclaration hier à la 202e session du Conseil exécutif de l’UNESCO à Paris. L’Ambassadeur Moin ul Haque a déclaré que l’UNESCO avait fourni à la communauté mondiale une plateforme idéale de dialogue, de discours intellectuel et de plaidoyer en faveur d’un pouvoir doux, pour combler les écarts entre les nations et œuvrer collectivement à la paix et à la prospérité. Il a assuré que le Pakistan continuerait de collaborer avec la communauté internationale pour œuvrer en faveur d’un monde équitable, juste, tolérant, ouvert et socialement inclusif afin de l’améliorer pour les générations futures. L’Ambassadeur a remercié la Directrice générale sortante, Mme. Irina Bokova, pour les services qu’elle a rendus à l’UNESCO et pour sa gestion efficace et compétente de l’organisation. L’élection du nouveau directeur général a également lieu au cours de cette session. L’Ambassadeur Moin ul Haque a dit qu’il espérait que le nouveau Directeur général poursuivrait, avec le plein appui des Etats membres de l’UNESCO, le bon travail de ses prédécesseurs et lancerait des réformes courageuses pour rendre l’UNESCO plus efficace et plus productive. Paris 11th October 2017: UNESCO has achieved many milestones in the fields of education, culture, science and communication despite facing many challenges. 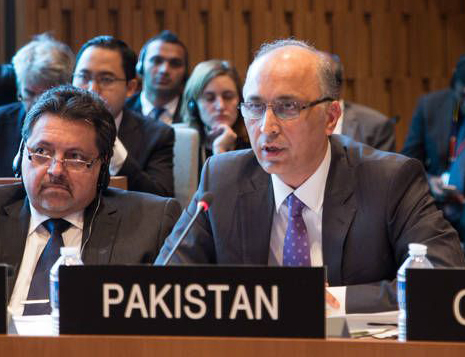 This was stated by the Ambassador of Pakistan to France and Pakistan’s Permanent Delegate to UNESCO Moin ul Haque in his country statement at the 202nd session of UNESCO Executive Board held in Paris yesterday. Ambassador Moin ul Haqwue said that UNESCO has provided the world community an ideal platform dialogue, intellectual discourse and advocacy of soft power to bridge distances between nations and to collectively work for peace and prosperity. He assured that Pakistan would continue to work together with the global community in striving for an equitable, just, tolerant, open and socially inclusive world to make it a better place for our future generations. The Ambassador appreciated services of the outgoing DG, UNESCO Ms. Irina Bokova for her effective and able stewardship of the organization. Election of new Director General is also taking place during this session. Moin ul Haque hoped that the new Director General would with the full support of the UNESCO member states would carry on the good work of his or her predecessors and will initiate bold reforms to make UNESCO more effective and productive.